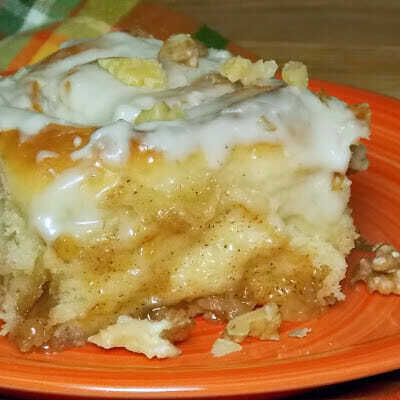 Apple Filled Cinnamon Rolls with Maple Walnut Frosting are made with fresh apples that have been cooked down into a sauce with sugar and cinnamon and layered in a soft delicious cinnamon roll. Baked to perfection and topped with a Maple Walnut Frosting! One of my favorite indulgences ever is cinnamon rolls. I look at pictures and drool and want. Usually I do not make because it only means that it has to be devoured and just one is never enough. That was the case with these apple filled cinnamon rolls I found over at An Opera Singer in the Kitchen. Noelle, the author of this awesome blog, truly is a singer and you can read all about her here! I was fortunate enough to have received Noelle’s blog for my Secret Recipe Club assignment this last month. I knew that this time around I wanted to bake something and I absolutely love pumpkin. Noelle has 3 recipes on her blog that I have bookmarked to make – Pumpkin Fritters, Pumpkin Spice French Toast, and Fluffy Vegan Pumpkin Biscuits. However the winner ended up being nothing pumpkin but something I absolutely can’t resist, Apple Filled Cinnamon Rolls! As you can tell, from the title of my post, I did change this recipe up. I decided to not make a vegan version and wanted to add maple and walnuts to the mix. I liked the idea of an apple filling in the rolls. I felt it would help to keep them moist as well as taste delicious! I made my own apple filling with apples I got from my Field Goods package. I love the filling! I did use real butter and that buttery taste was just too good to resist. After Grumpy ate his first cinnamon roll, he went out into the kitchen and got seconds. I didn’t realize his seconds also included the half portion of what was left of the roll I took as I went out to get my other half and he had not only taken another huge roll, but my half! These did not go to waste by any means! 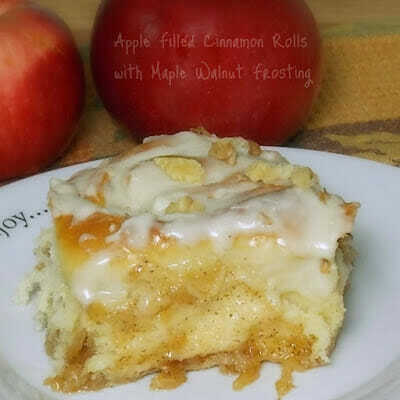 Other apple recipes you may enjoy! In large mixing bowl (or Kitchen Aid) add flour, sugar, salt and yeast. Stir to combine. Add eggs and milk and mix until well incorporated. Continue to add a little bit of flour while beating in Kitchen Aid until dough no longer sticks to sides of bowl. Turn out onto floured surface and knead a few times. Set aside in oiled bowl and let rise until doubled. (about 1 hour)While dough is rising make apple filling. Saute sugar and butter until bubbly. Add apples and cinnamon, toss to coat. Stir in water and lemon juice. Bring to a boil then turn heat down to a simmer. Simmer until most of the liquid has absorbed and filling is thickened. When dough is ready, punch down dough to deflate (my favorite part!). Roll dough out onto lightly floured surface into a rectangle shape (about 16×2″). Spread softened butter over top of dough. Sprinkle with cinnamon sugar mixture.Top cinnamon sugar mixture with apple filling.Roll dough into a cylinder along the long side. Pinch seams together. Using a piece of dental floss (yes, unwaxed dental floss! ), slide it under the roll and slice it in half by bringing the floss together and crossing it. Slice each half into again, then slice 3 more pieces. My family LOVES cinnamon rolls, too. 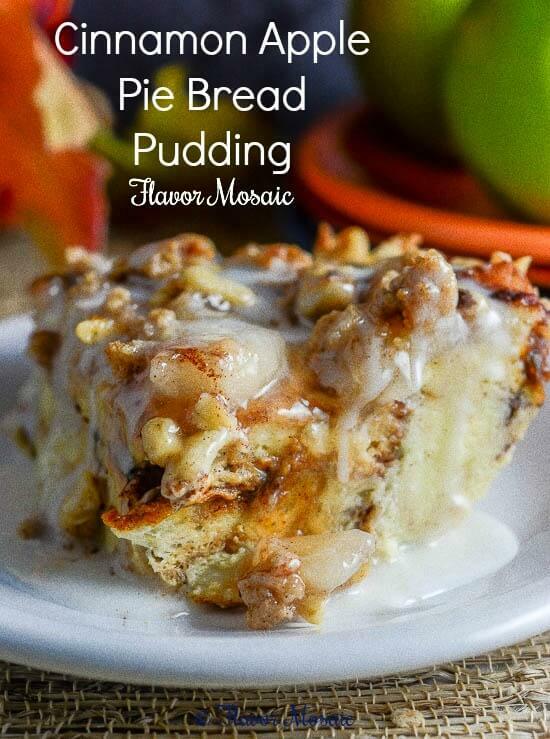 Love the idea of adding apple filling. I want. Yum! These sound delicious! 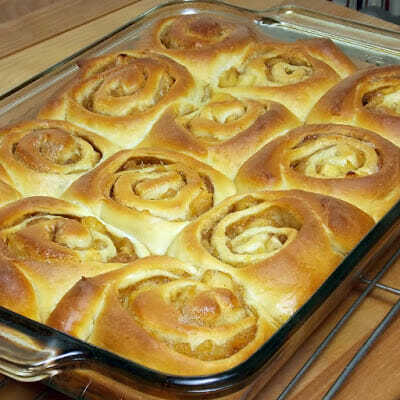 I've never made cinnamon rolls because all the waiting around for rising sounds like a pain… but I may have to try for these ones! Wish i had one of these with the cup of coffee I am drinking. Going to check out the other recipes too. Oh my goodness, those look insanely good!! Love the apple in there and that maple walnut frosting sounds amazing. Great pick!! I made cinnamon rolls with an apple pecan filling this weekend. They were good, but I like the sound of your filling better. I'm going to have to try that next time. These look amazing!! Wow! Those look amazingly delicious…and decadent. Thanks for sharing with the SRC. I will definitely make these once apple season is in full swing. Oh my gosh!! These sound absolutely delicious!!! Can't wait to try these!! Apples make cinnamon rolls healthy, right?! I can't wait to try these. They sound so amazing. I hope I can make the cinnamon rolls. These look fantastic. Pinned them for the future! You have me drooling and wishing I had one right now! Delicious! Perfect for fall! All the apples are so good right now and this sounds simply divine! Thanks Shelby!